On First Take Fridays a number of authors around Meeple Mountain give short first takes on games that are new to us. 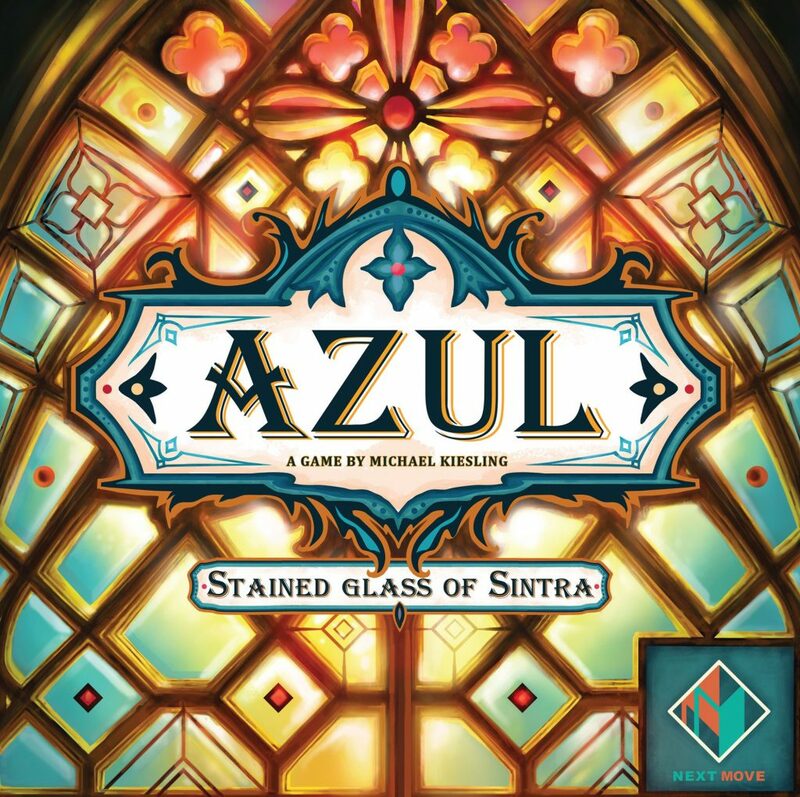 This week we have takes on Azul: Stained Glass of Sintra, Indian Summer, Dungeon Mayhem, and Obsession. Is Azul: Stained Glass of Sintra different enough from the original Azul for someone to justify having both in their collection? This was my main concern when I heard about this new version. Azul: Stained Glass of Sintra shares several similarities with the original, but the differences are where Sintra shines. On a player’s turn, they have 1 of 2 actions from which to choose. The first, similar to Azul, is to take pieces of the same colour from a Factory display or the centre of the table and add them to a single strip’s pattern on your player board. The second option, instead of taking pieces, is to move your Glazier (pawn) to the leftmost strip of your player board. This is an important action because you can only add pieces to a strip that is below or to the right of your Glazier and the Glazier will always hop over to the strip onto which you place your pieces. Scoring is also different in Azul: Stained Glass of Sintra. Once a pattern strip is complete, players will score the points for that strip AND the points for any strips they’ve already completed to its right. Additionally, each round will have a colour bonus which scores 1 point for each piece of that colour used in a completed pattern. Players will also score points at game end depending on whether they use side A or B.
I almost liked Azul: Stained Glass of Sintra as much as my first play of Azul (which was quite a lot). The game is still accessible and a great gateway game, yet its gameplay is different enough that I could see a person owning both versions (but whether they need to is different question). My only complaint would be with the quality of the coloured pane pieces; they are made of plastic, feel kind of cheap, and look like a throat lozenge. It’s unfortunate because Azul: Stained Glass of Sintra is a really good game, but I won’t let this deter me from playing it again. 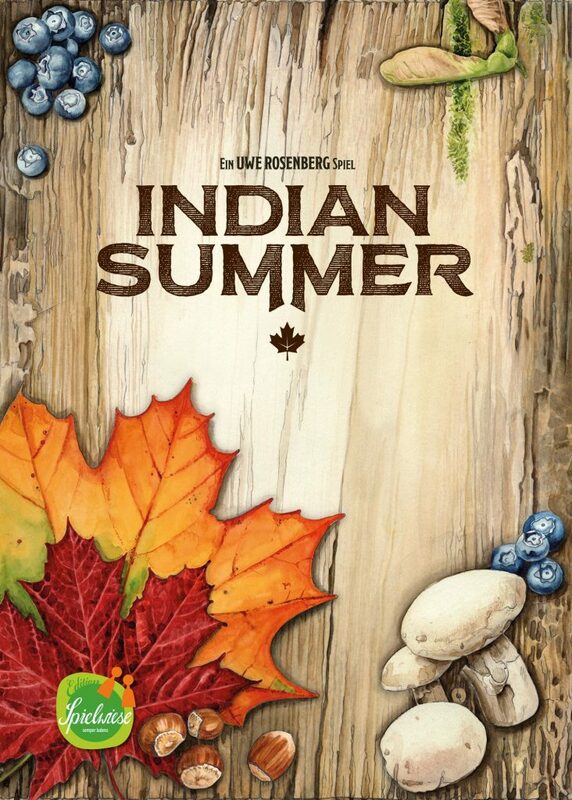 Indian Summer is the second game in Uwe Rosenberg’s puzzle trilogy. The first game in the series, Cottage Garden, had players trying to fill up their garden boards with polyominoes as quickly as they could in an effort to score the most points by the game’s end. In between the players, there was a board that had been divided into a grid and each grid square contained a playing piece. It was possible for players to look ahead and predict which pieces would be available to them on their upcoming turn. It was this predictability that allowed players to strategize and plan ahead of time. While not one of Rosenberg’s deeper games, it was still fun to play. On the surface, Indian Summer looks to be the same kind of game. Each player has a forest floor board and they’re adding polyomino tiles to it. My initial concern going in was that Indian Summer was just going to feel like more of the same. Thankfully that isn’t the case. In Indian Summer, players are given a forest floor board and 5 tiles that form their personal path. In between the players is the central path which is used to refill the player paths once those have run out of tiles. Each forest floor board is pre-printed with an assortment of treasures (acorns, berries, mushrooms, and feathers). These boards are divided into grids and each grid is divided into six distinct sections. The players take turns playing tiles from their personal paths onto their forest floor boards. Each of these tiles has tiny holes in them. Ideally when placing a tile onto your forest floor board, you want to make sure that these holes are directly over one of the treasures so that when the section of the board is filled in, you’ll be able to collect the treasure. Each treasure, after collecting it, can be used to perform some kind of special action such as taking a tile from an opponent’s path or refilling your own tiles from the community path earlier than you’d normally be able to. You can also trade your collected treasures for other ones. This ability to hoard treasures and then use them to do a lot of different things leads to a lot of exciting turns where you’re chaining various actions together. There are times where your action chaining will cause a huge chunk of your forest floor board to fill up in one incredible turn. I’m a big fan of games that provide this kind of thrill and Indian Summer is no exception. I really like this game a lot. It gives me that same kind of satisfaction that I get from chaining combos together in games like Magic: the Gathering or Seasons. My only gripe about the game is that there are a lot of minute details to remember and the game doesn’t provide you with any kind of player aids to help you out in that regard. Indian Summer just gets me excited to eventually play the third game in the series, Spring Meadow. I’m dying to get my hands on that one! 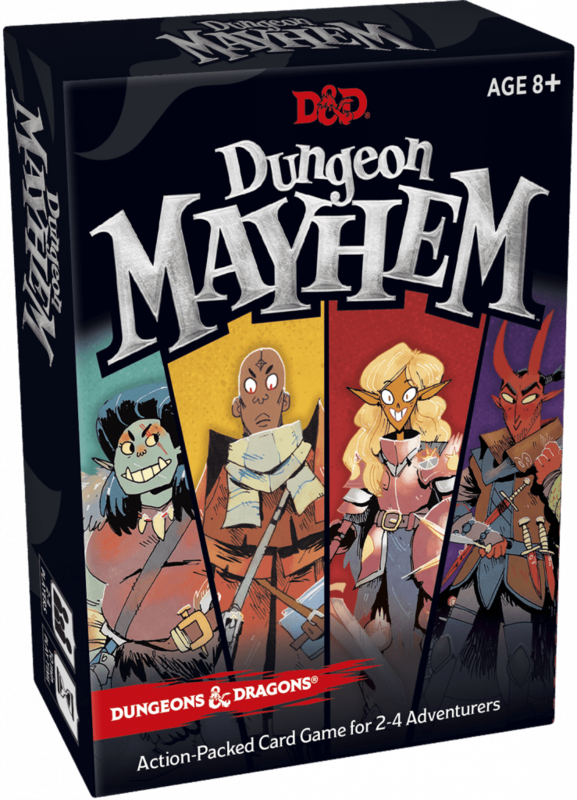 Dungeon Mayhem is a fresh-off-the-presses card game from the Dungeons & Dragons team at Wizards of the Coast. The game is extremely simple to learn, fast-paced, and quick to play. The object of the game is simple, you are an adventuring party that has turned on each other in order to grab the loot and only one of you can survive to claim the treasure. You pick one of four character decks that are mostly the same with some special powers thrown in for variety and flavor. There’s a barbarian, a wizard, a paladin, and a rogue. The cards fit their characters well. For example, the elven paladin Lia the Radiant has a defense card that is her Divine Shield. But, the half-orc barbarian Sutha the Skullcrusher has a Bag of Rats instead. Each player takes turns playing one or more cards from their hand that will either deal damage, provide extra defense against damage, heal damage, draw more cards, play more cards, or some combination of those choices. You choose who you deal damage to and when that person is reduced to 0 life they’re out of the game. Play continues until one person is left standing. I love playing this game with my family! The suggested age is 8+ but my 5 year-old was able to play as long as someone explained what the cards did. It also held his attention, which is a challenge at that age. It was quickly his turn again and we were done with a game in less than half an hour. As with any free-for-all style game someone inevitably gets dog-piled on. That person in our games was, of course, me. But, I never felt like I was out of the game for too long because the game doesn’t last that long. I highly recommend this game for families, especially those who play D&D or are wanting to introduce their kids to some of the basic D&D concepts. Additionally, this is a great filler game to play while waiting for someone to arrive to game night or on snack breaks. Dungeon Mayhem can be found where ever Dungeons & Dragons products are sold. Read more from Than Gibson. 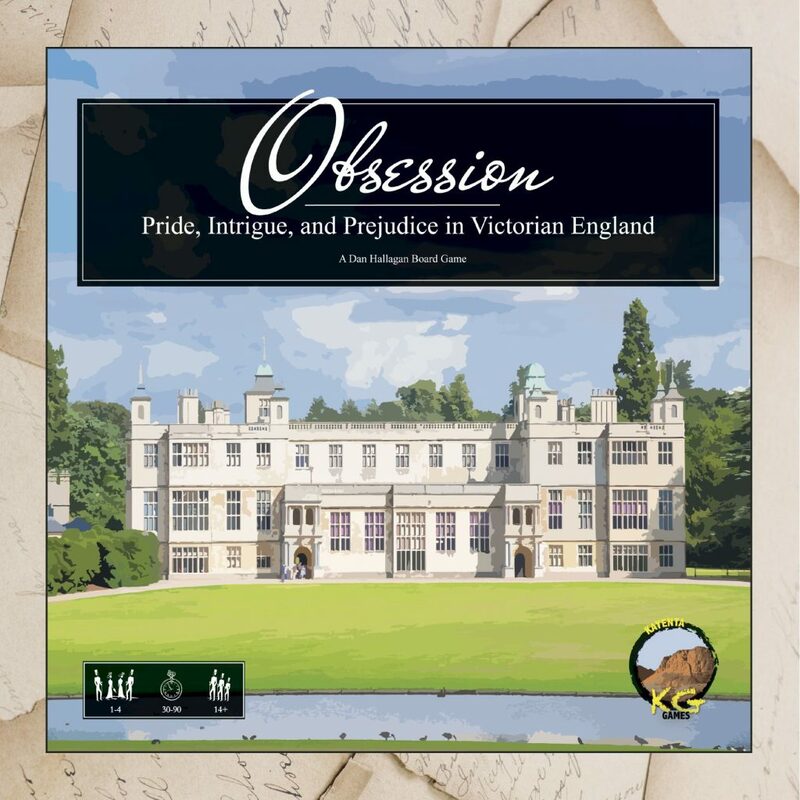 Set in Victorian England, Obsession is the embodiment of a Jane Austen novel. At the start of the game, your family is just beginning to gain their fortune and if you play your cards right, you might just earn the favor of the wealthy Fairchild family. The core mechanism of Obsession is throwing events and attracting exciting guests. There are five main types of events, gaining money, expanding your estate, attracting new friends, developing your family, and gaining prestige. Successfully navigating these actions is necessary to build an effective engine and improve your reputation. My personal favorite mechanism in the game was maintaining your family’s prestige. At the beginning of the game you have level one prestige, but for every five prestige points you gain, your prestige increases. The reason this is so important is the friends you have available and the quality of events you can throw are limited by your current prestige level. Obsession is the kind of game where you need to accomplish everything, and you certainly can if you play well enough. The gameplay is fairly streamlined while providing a large enough decision space that it is important to have a plan. Between the variable starting powers and the large variety of events and friends you can attract, it does feel like there’s enough variety in the box to keep me coming back for more.